Just as the leaves are turning colors and the chilly autumn wind is blowing in South Germany, our pulsFOG Marking Team is making their way to sunny Irapuato, Mexico to exhibit at the 11th Annual Expo AgroAlimentaria Guanajuato from 14-16 November 2017. Focused on making Agricultural, Horticultural, Agro Industrial business contacts between companies of the agricultural sector and visitors of the same branch, this highly anticipated expo is the most important agro-food event in all of Latin America with over 1,300 exhibitors and more than 120,000 visitors each year. At Expo AgroAlimentaria Guanajuato, pulsFOG will be showcasing our entire product line with focus on our ever-popular tracFOG stationary cold fogging machine. This year marks the 10th year tracFOG market launch anniversary in the Brazil, along with successful introduction into the greenhouse market in USA, Canada, England and Italy, as well as the launch for avocado plantations in South Africa and Brazil. pulsFOG is currently moving forward with the tracFOG market launch in Mexico for plantations, orchards and greenhouse applications. This is why we found a perfect fit to highlight our beloved tracFOG next week at the Expo AgroAlimentaria Guanajuato. We pride ourselves on tracFOG being the world’s first PTO driven cold fogging machine. 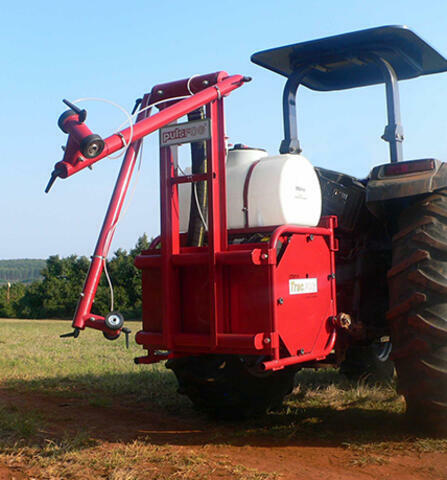 The tracFOG PTO driven fast fogger is a tractor mounted fogger that creates ultra-fine particles and propells them hundreds of feet. It is available with a 400 liter or 100 liter tank and two directable nozzles. The new Autovalve version includes solenoids to control each nozzle as well as a pneumatic directional reversal. Their office is located at: EQUIP, S.A. de C.V. Av. Juventud No. 8-1 Col. Los Nogales Corregidora, QRO. 76900 MEXICO. We look forward to seeing you in beautiful Me-hi-co!